This collection of recent essays on Hemingway and For Whom the Bell Tolls demonstrates the centrality of this Spanish Civil war novel in the author's life and canon and reestablishes the book's status as an American masterpiece. It provides a long overdue reassessment of the novel, which was an overwhelming critical and popular success in 1940. Following Rena Sanderson's introduction, the volume begins with a reconsideration of Hemingway's career by novelist Kurt Vonnegut. Ten literary essays by both well-known specialists and new voices follow. Employing a diversity of critical methods, including the biographical, historical, political, textual, ethical, feminist, religious, mythic, generic, and post-structuralist, these essays reveal the literary and historical richness of Hemingway's novel. 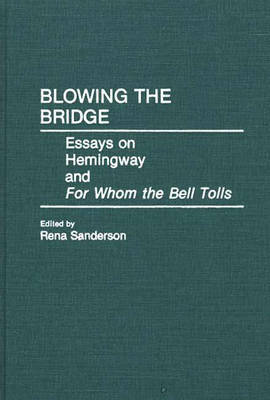 Informed by recent developments in Hemingway scholarship, the chapters add up to a valuable Hemingway resource. The book is an important contribution to Hemingway studies, American literary scholarship, and American studies. It is essential reading for anyone working on For Whom the Bell Tolls.